A variety of catering options at the busy Milton Interchange. 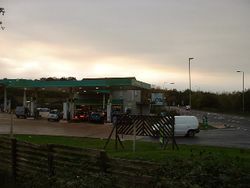 The original forecourt, before it was re-built. Originally just a petrol station and an outdoor toilet block next to the A4130, the services later gained a McDonald's, and a budget hotel-restaurant. More recently, the nearby town of Didcot (located at the junction of two major railways) was identified as prime land for development, which extended to the services. 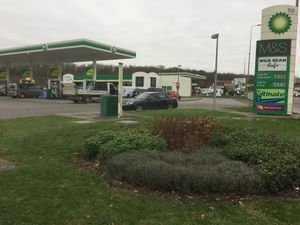 The area around the services has now gained more restaurants, a complete refurbishment of the petrol station, a new shop, a Costa drive thru and a Vauxhall dealer. The land the services is built on was originally called Milton Heights. This name has crept back into use, following the opening of the large employment centre opposite (Milton Park) and the high-profile roadworks at the nearby roundabout (Milton Interchange). During 2018, the former Table Table pub-restaurant was converted to a Beefeater. BP Express operate the filling station here.